The Fortress of Panikotha in Diu is a magnificent stone structure in the sea. The structure built in the shape of ship is very unique. It also has a light house and a small chapel dedicated to Our Lady of the Sea. 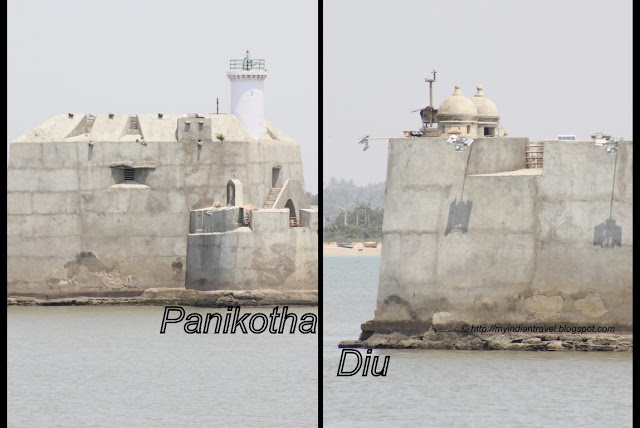 This structure looks magnificent when one observers it from either Diu Jetty or Diu main land or from the Fort. You can reach this place through a ferry boat from the fort. RAJESH...Have you ever been out there? It is such an unusual structure but so pretty. Love the light house and the idea of the little chapel. You have gotten me so interested in your country that I am now reading a memoir written by Madhur Jaffrey entitled “Climbing the Mango Tree.” It is wonderful. structure very beautiful and totally unique..
Hello, great shots of the fort. Thanks for sharing. Happy February, enjoy your new week! Interesting building......a good idea to ask for protection from the elements. Boa tarde, a selecção de imagens é perfeita, revelam bons detalhes. A very unique floating fort...shaped like a ship! The designer was creative! What an incredible place, Rajesh!!! Wonderful captures, as always!! And thank you, as always, for sharing the beauty of your world!! I hope you and your family have a great start for new year!! This structure does look like a large ship! I'm surprised to learn that there is a chapel on it. Very pretty. It looks like a queen dresses in white. Nice location, although being afraid of water going there by a small boat does not thrill me. What an awesome place - it looks like it would be fun to explore. It certainly is magnificent, I imagine it would be very interesting to take a trip across and see it from the inside - it looks fairly impenetrable unless by invitation! Love the lighthouse and the idea of having a chapel out there. So pretty! The monument and the waters blend into each other and give a classic view! The fort looks very strong. Is it allowed to get inside the fort? Dipanwita: One can reach the fort by taking a boat ride.